The Large Hadron Collider has beaten another record by delivering about 111/pb in 24 hours to ATLAS. 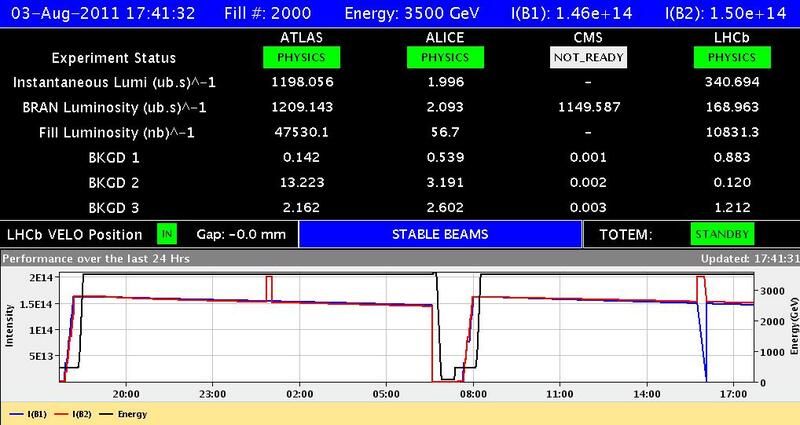 The total came in two runs with a turn-round of just 2 hours 5 minutes in between, also another record for the LHC. This follows a frustrating period of technical hitches that has been limiting luminosity production since the last technical stop. Of course any such difficulties should be kept in perspective. The Large Hadron Collider is currently running at over 10 times the luminosities anticipated for this year and has already delivered nearly twice the total predicted for this year, but the more you have the more you want. A possibly more worrying problem is that CMS was apparently only able to record about half the collision data today. There is as yet no word on what problems it may be experiencing. Update 4-Aug-2011: The second of these runs which was fill number 2000 provided more records by continuing for 21 and a half hours (the longest yet) and delivering 90.6/pb to ATLAS (the most for a single run). This entry was posted on Wednesday, August 3rd, 2011 at 3:57 pm and is filed under Large Hadron Collider. You can follow any responses to this entry through the RSS 2.0 feed. Both comments and pings are currently closed. CMS had – and still has, by the looks of it – what’s described as a “cooling problem”. Hi, thanks Phil for keeping us posted. I believe that despite CMS problem they have collected already more than 2/fb ! they will break the 2/fb . Well, these plots includes fills up to yesterday. So, I still believe that Atlas tonight broke the 2/fb! forget 2010, it’s not mixed with 2011 data. Peanuts. The whole dataset is made up of sections of different sizes where pile-up levels and triggers varied. These all have to be added up with different models for background in each case. So there is no reason why 2010 data should be left out. It is no different from the different pieces of 2011 data. Now they’ve got the machine ticking along nicely at 2/ub/s, I wonder if they’ll risk increasing the bunch intensity again? They’re going to reduce beta* during the next TS to increase the luminosity by another 50% upto 3/ub/s and you mentioned them not wanting to go above 2.7/ub/s because of pile up. Perhaps they will go for a strategy to keep things as they are, getting 3/fb of data. Then using the next MD to study the effects of increased bunch intensity on vacuum activity, working out a new strategy for the final 8 weeks. Good point, of course they can still increase bunch intensity but use luminosity leveling to keep below 2.7/ub/s, but the payoff is less for more risk. I also think that if they are stable for a few days they will want to try to increase luminosity a little more now before the technical stop after which they may have to recover stability again. And there is another problem: luminosity half life decreases with luminosity. Over 21 hours, they collected 95/fb, whereas at half luminosity over the same period, they collected 60/fb. What about switching to 1/fb as the unit for all integrated luminosities over periods of one day or longer?